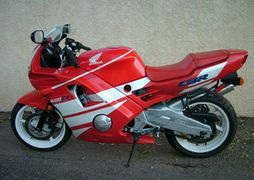 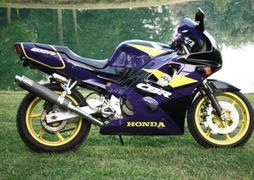 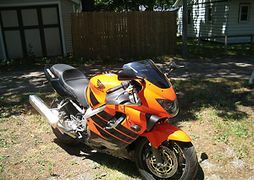 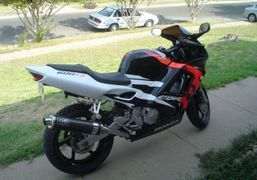 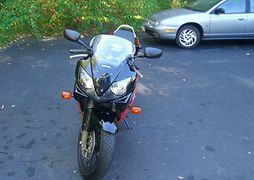 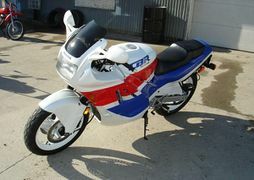 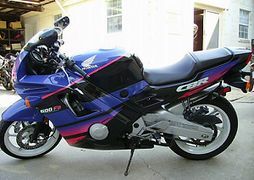 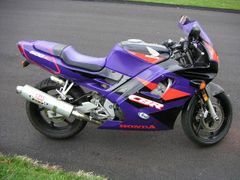 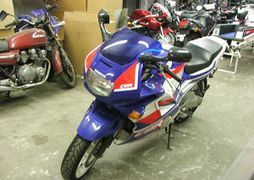 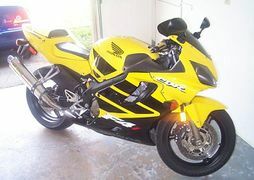 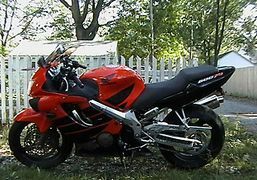 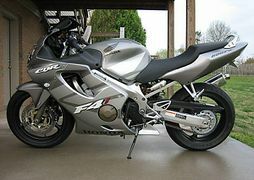 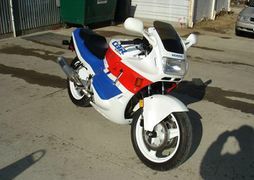 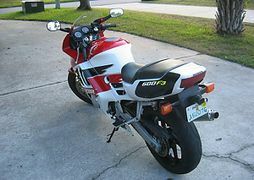 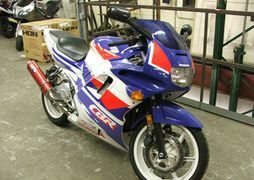 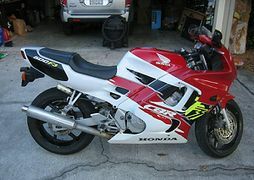 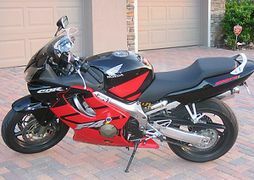 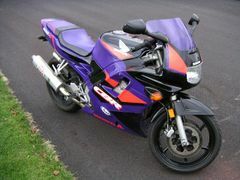 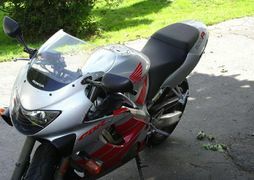 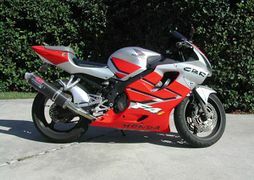 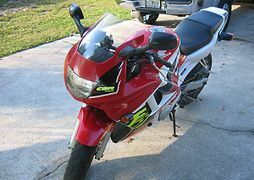 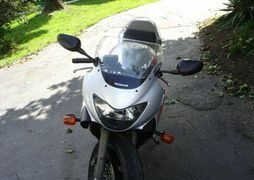 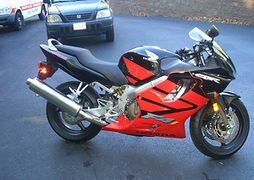 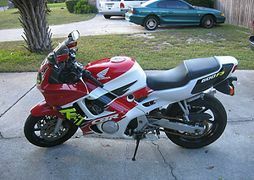 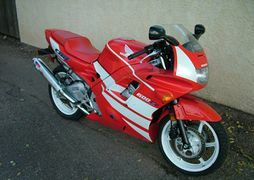 The Honda CBR600F series which started out with the 'Hurricane', are sportbikes made from 1987-2005. 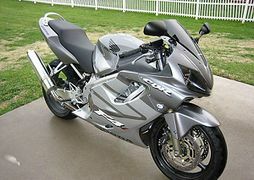 They feature a 600cc inline four engine. 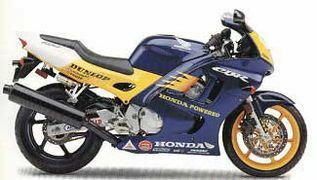 In 1989 the 'Hurricane' moniker was dropped and they began being known as F1, F2, F3, F4. 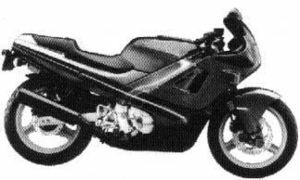 Later versions of the F4 included fuel injection and are known as F4i. 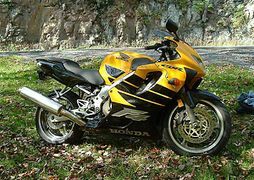 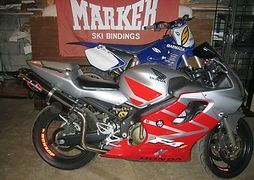 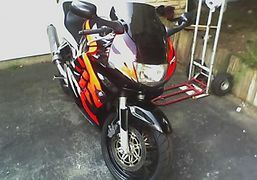 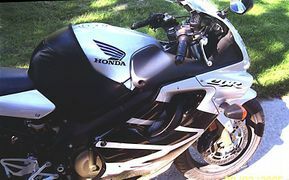 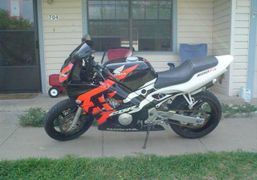 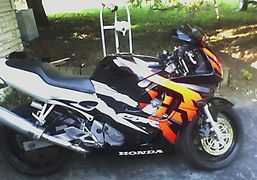 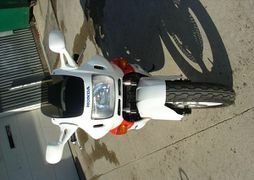 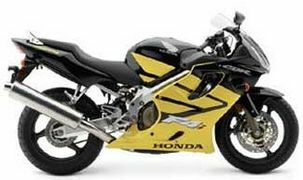 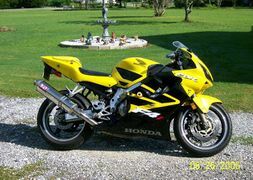 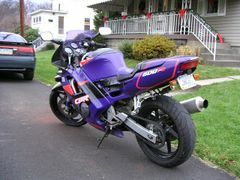 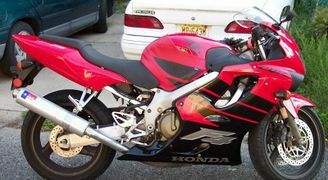 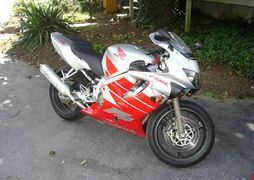 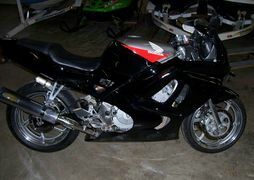 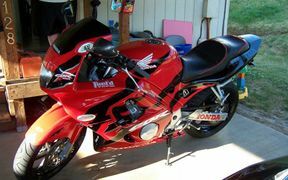 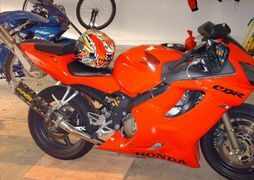 They were replaced by the CBR600RR as Honda's premier 600 class sportbike. 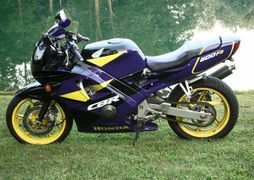 Some motorcycles raise the bar. 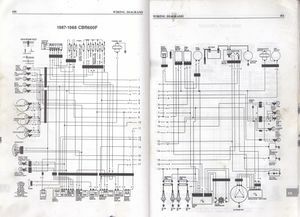 Others rewrite the rules. 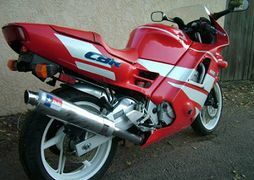 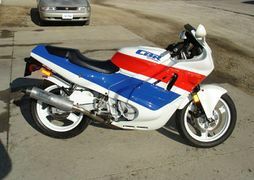 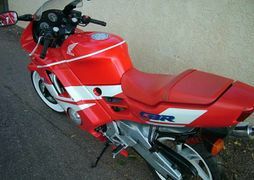 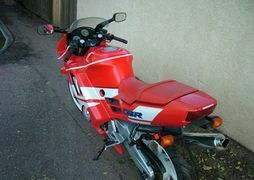 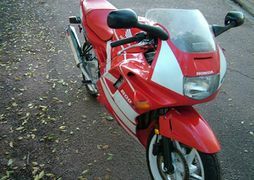 In the 1987 sportbike game, Honda's CBR®600F, better known as the 600 Hurricane,® was clearly one of the latter. 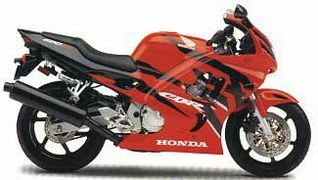 Introduced along with its big brother the CBR1000F, Honda's 600 Hurricane was a revolution. 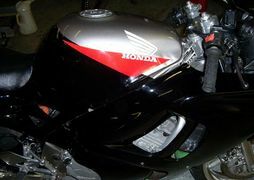 The reason was clearly visible in the Hurricane's aerodynamic, full-coverage bodywork. 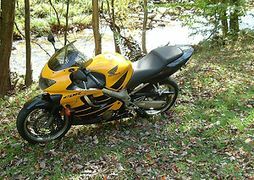 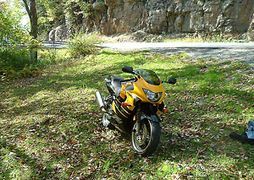 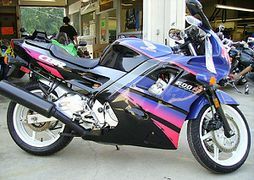 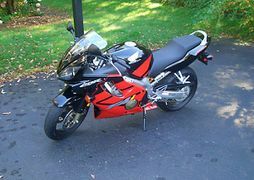 Less visible was the technological paradigm shift that blew away every other middleweight sportbike on earth and forever changed the way sportbikes were designed and built. 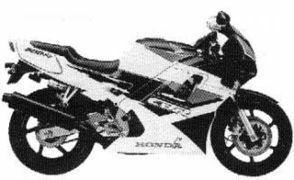 Honda engineers wrapped the Hurricane's engine and chassis in full-coverage, interlocking bodywork for more than aerodynamic reasons. 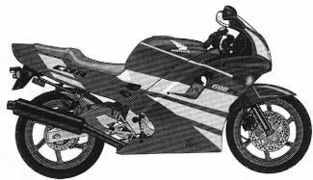 Beneath the Hurricane's slick plastic skin, engine and chassis surfaces appeared unfinished, almost industrial. 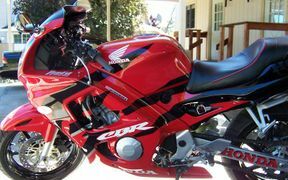 Development dollars saved on hardware beautification were spent instead on components that would redefine sportbike performance. 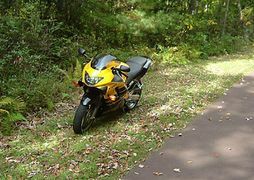 While the Hurricane's double-downtube, box-section steel-tube frame may have looked plain, the balance of agility and stability provided by its 54.6-inch wheelbase and racy 26.0-degree rake was beautiful. 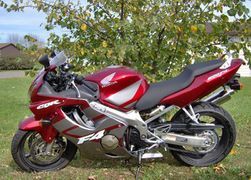 The Hurricane's trio of disc brakes were the best in the business, and at about 450.0 pounds wet, the bike was 20.0 pounds lighter than its nearest rival. 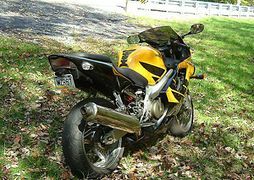 Power came from a dramatically oversquare, liquid-cooled, twin-cam in-line four-cylinder engine. 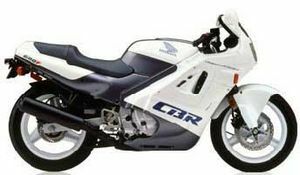 With half the cylinder and head castings of the 500 Interceptor's® V-4 engine, the in-line CBR mill was less expensive to produce. 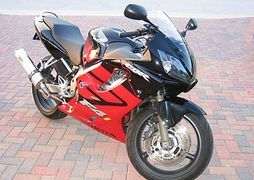 The Hurricane engine redlined at 12,000 rpm and cranked out 85 horsepower at eleven grand—enough power to make the Hurricane the first 600cc sportbike to cover a quarter-mile in under 11 seconds. 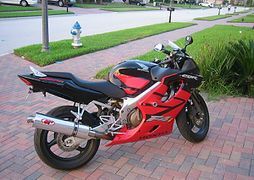 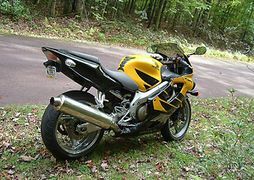 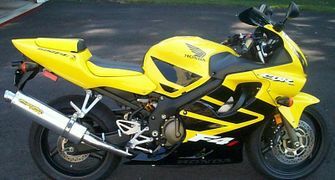 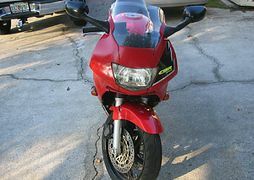 As the magazines of the day discovered, no other sportbike could match the Hurricane's marvelously balanced, accessible mix of horsepower and handling at any price, let alone the Hurricane's affordable sticker. 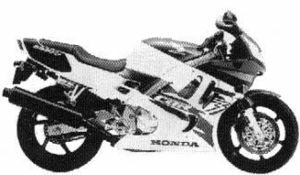 The esteemed Cycle magazine dubbed the Hurricane "The best Japanese motorcycle we have ever tested" in its May, 1987 issue. 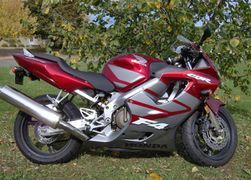 The Hurricane's humane ergonomics and compliant ride proved that track-sharp handling didn't have to hurt anybody but the competition. 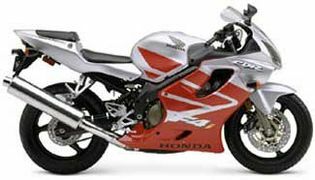 Backed by Honda's investment in one of the richest contingency programs in history, Hurricanes filled club-racing grids all over America, launching 600 SuperSport racing into the limelight as one of the most popular and hotly contested road-racing series in the world. 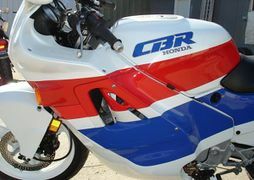 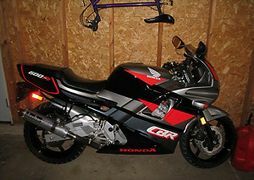 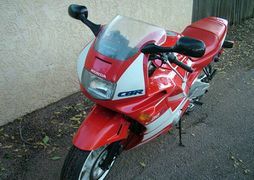 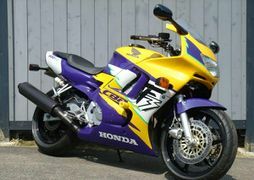 Perhaps more powerful is the enduring and endearing nature of Honda's original CBR concept: the same basic concept found in the current CBR600F4. 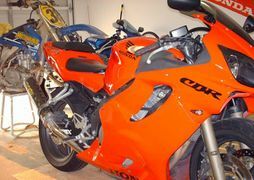 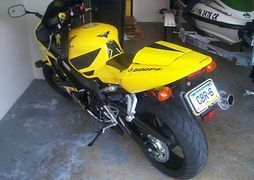 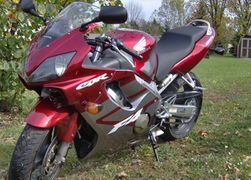 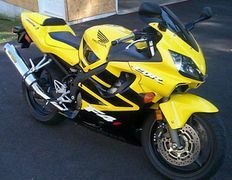 Other ideas have come and gone, but CBR600s have been the best-selling sportbike in America since the original Hurricane. 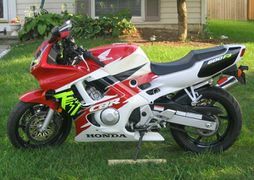 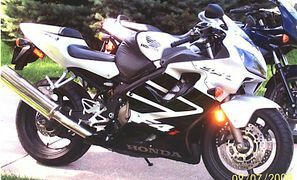 From rookie sport riders to 2000 Daytona 600 SuperSport winner Kurtis Roberts, no sportbike has ever provided such exceptional versatility as Honda's revolutionary CBR600. 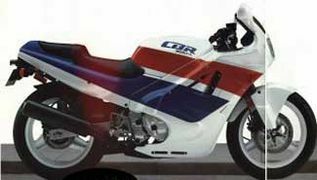 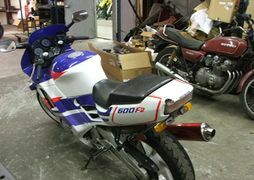 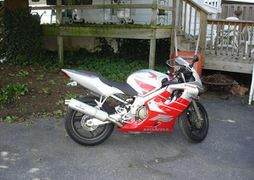 The CBR600F'87 Hurricane 600 was sold in 1987 in one of two color schemes: Pearl Crystal White with Fighting Red or Black with Monza Red. 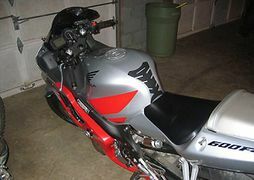 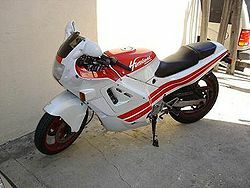 The "HURRICANE" logo on the white bike was white while it was black on the black bike. 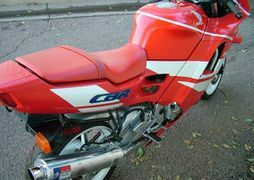 The wheels were red. 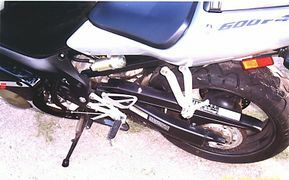 The exhaust system was 4-into-1. 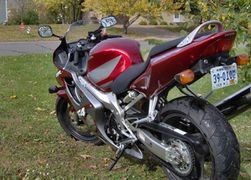 The engine was a 598cc DOHC 16-valve liquid-cooled inline four linked to a 6-speed transmission. 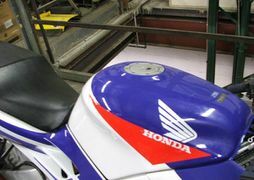 The serial number began JH2PC190*HM000001. 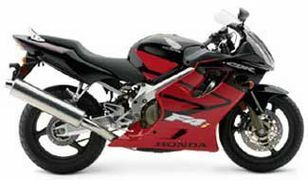 Honda's first-generation CBR600F established new standards for the middleweight class. 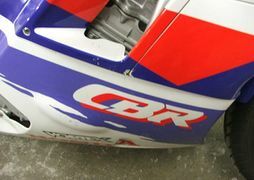 The Hurricane's unique full-coverage bodywork allowed engineers to skip costly engine cosmetics and focus development dollars inside the engine cases. 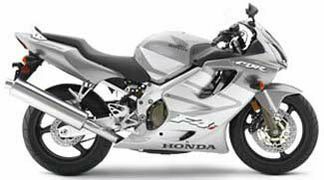 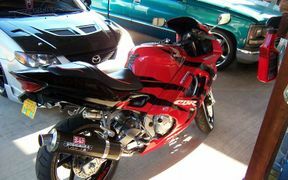 The result was a class-leading 83 horsepower from the CBR's liquid-cooled dohc inline-four. 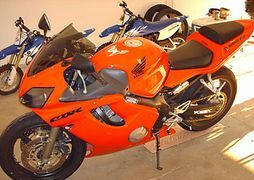 With a dry weight of 396.8 pounds--the lightest 600 available--the Hurricane blew away the competition, yet remained true to its design philosophy by offering versatility to match its incredible performance. 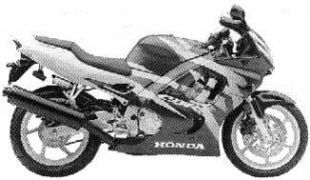 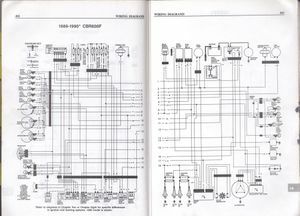 For the 600's first makeover, Honda focused its attention on the engine. 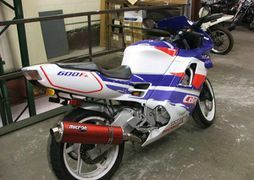 Revised porting and a new stainless steel exhaust system allowed the engine to breathe more easily, while altered cam timing, reconfigured pistons and combustion chambers, a slightly higher compression ratio and new ignition and carb settings helped make best use of the air/fuel mix. 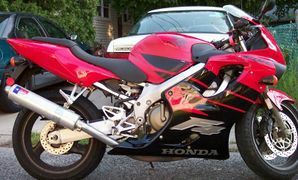 These carefully orchestrated engine changes yielded 10 more horsepower, making the CBR600F that much harder to catch on the street and on the track. 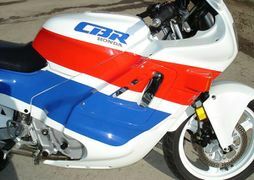 Honda redesigned the CBR from the contact patches up to create the class-leading F2. 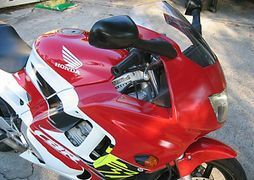 A lighter and more compact inline-four engine pumped out an astonishing 100 horsepower, thanks to more oversquare dimensions, bigger carbs, higher compression and significant reductions in internal friction. 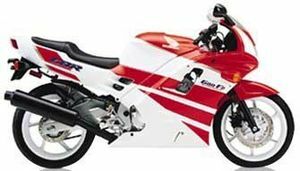 A stiffer frame, shorter wheelbase, revalved suspension, stronger brakes and RC30-style wheels gave the bike handling manners to match. 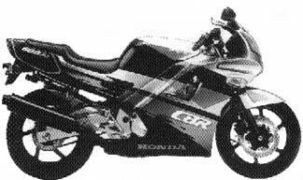 Once again the CBR600 was the lightest, quickest and most powerful middleweight the world had seen. 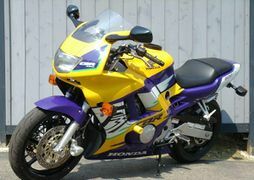 Increasing sophistication marked the fourth variation of Honda's middleweight champ. 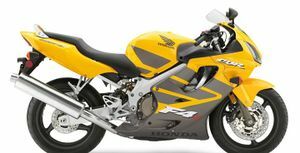 The F3 got stronger via a Dual-Stage Ram Air system, more compact combustion chambers with a higher compression ratio, a computer-controlled 3D-mapped ignition and a comprehensive program to reduce internal engine friction. 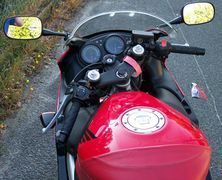 Again, a retuned chassis, including freshly recalibrated suspension systems and bigger brakes, helped the F3 keep its handling edge, while still maintaining class-leading livability on the street. 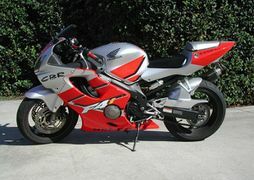 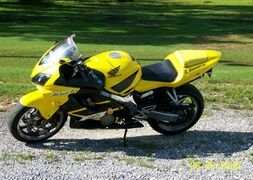 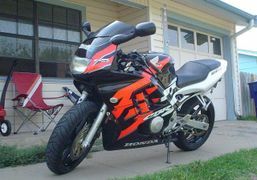 Totally redesigned for 1999, the CBR600F4 continued to push the boundaries of 600 performance even higher. 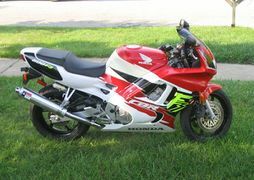 Lighter, more compact and significantly more powerful, the F4's all-new inline-four engine used the latest Honda design and manufacturing technologies, including RC45™-inspired aluminum composite cylinder sleeves and LUB™-Coat pistons, and a new dual-stage ram-air system to crank out an incredible 110 horsepower. That new engine bolted to an aluminum Pro Frame™--a first for the CBR600--that was more rigid than the previous steel frame, yet 15.4 pounds lighter, for a feathery overall weight of just 372.6 pounds. 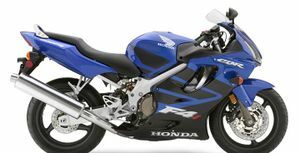 New suspension systems, including fully adjustable Honda Multi-Action Suspension™ (HMAS) components, race-spec brakes, wide three-spoke wheels and low-profile radial tires round out the F4's exceptional handling package. 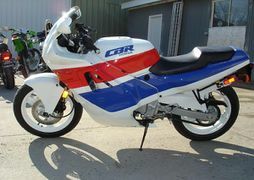 The one thing that hadn't changed, though, was the CBR's all-around capabilities, making it as comfortable on the street as it is competent on the race track. 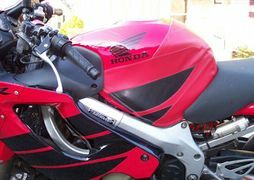 This page was last edited on 15 February 2019, at 01:06.